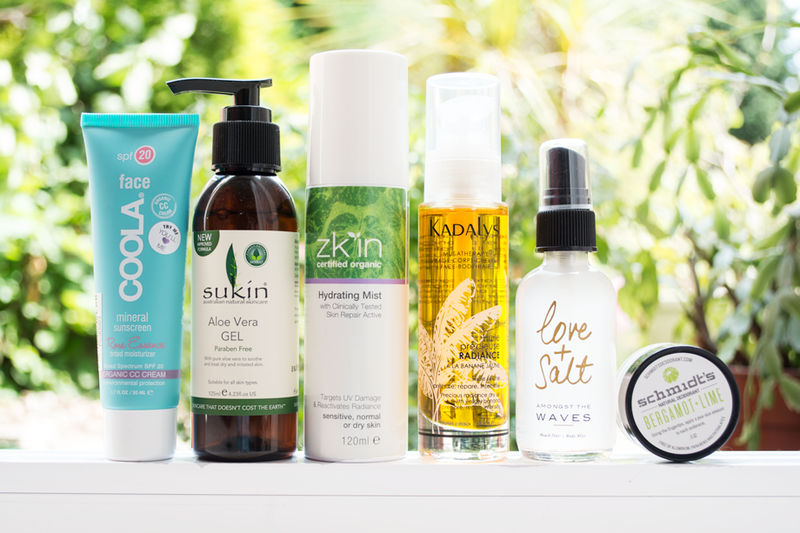 Summertime is most definitely in full swing and, along with the sunshine, I've noticed a little shift in the products I reach for regularly during the day. In winter, it's simply an endless supply of lip balm, but summer calls for a few more products to cope with the heat and extra sun exposure! I've put together 6 of my current top product picks that are particularly effective for spending time in the sun! This facial sunscreen is 98% natural and uses Titanium Dioxide (non-nano particles) for broad spectrum protection against sun exposure, instead of chemical UV filters that have potential safety concerns. (Note: some of the range does contain chemical filters so be sure to check individual product ingredients if you prefer to avoid these)! This particular product is marketed as a CC cream, which provides a light coverage to even out the skin. Although it's said to be suitable for all skin tones, I find the colour a little too dark for me but it's just about passable once blended out and used under makeup for low sun exposure days. Just in case you accidentally spend a little too long in the sun, aloe vera is your best friend. Ideally, I would recommend applying straight from a leaf cutting from an aloe vera plant, but if you're out and about or don't have an aloe plant at home then you might want a bottled version. This one comes in a pump bottle and works really well to soothe the skin, but the alcohol in the formula gives quite a strong scent which might be off-putting for some. For an alternative use, I picked up a tip from Kate (Wild Organic Beauty) to use Sukin's Aloe Vera Gel as a hand sanitiser and add a few drops of essential oil for scent - genius! This is a fantastic product to use after sun exposure and I've especially loved using this over the past few weeks of warmer weather. It has a predominantly lavender scent with a slight hint of vanilla and ylang ylang and feels really refreshing on the skin. The ingredients are an amazing 97% organic and one of the key ingredients is brown seaweed extract which is said to help fight UV damage (this actually makes the mist itself brown in colour too)! I caught the sun with some minor redness the other week and after spritzing this hydrating mist the redness disappeared almost instantly! I kind of wish this was packaged in a glass bottle instead of plastic, but other than that I can't fault the effectiveness of this product at all! Another product which is great to use after spending some time in the sun. Kadalys is a French brand specialising in natural products containing banana extracts. The Radiance Oil is 100% natural and it's a dry oil, meaning it's non-greasy so sinks into the skin much quicker than other oils and leaves a satin finish. It comes in super luxurious glass packaging and has the most amazing fruity scent! It helps soothe and moisturise the skin, prolongs that tan glow and you can even use it on your hair too. I won't go into too much detail with these two as I've reviewed them before, but they're both absolute essentials for summer! Olivine's Love + Salt Mist (reviewed here) not only has majorly Instagram-worthy packaging, it's also ideal creating those beachy waves in your hair. I finished off my full sized bottle recently so I'm using a cute little travel size at the moment - perfect for keeping in your bag! I also keep a travel size of Schmidt's Deodorant for occasional use when the weather gets really hot. It's so effective for days when you need a heavy duty deodorant and the Bergamot + Lime scent (reviewed here) smells amazing too! What natural products do you love for summertime? Have you tried any of these before? Love your run down of top picks for the summer - as it gets hotter, I find my skin is more dewy, so I'm loving Bare Minerals' concealer, as well as my Salt of the Earth deodorant - considering it's only one ingredient, it works wonders! Great selection, in summer Aloe Vera gel is my best friend :) It's a shame that the Coola CC cream has quite a dark shade. I often find this with natural CC and BB creams, it's quite difficult to get a really light shade. But as you say, sometimes it just needs extra blending in. I really love Sukin, I saw that aloe vera gel the other day and I will grab some in the warmer months for sunburn! I love the smell of the Love & Roses mist but haven't tried Love & Salt yet! Also want to try Bergamot & Lime scent from Schmidt's as I've tried their Lavender Sage one but would like something a bit more citrusy for Summer!